This post is about my favorite simple stewed tomatoes recipe but, first and foremost, on this day of special days, I want to say: Happy Birthday Grandma!!! Thank you for reading and sharing my blog, and for being the awesome inspiring woman that you are. Okay, news flash you guys! 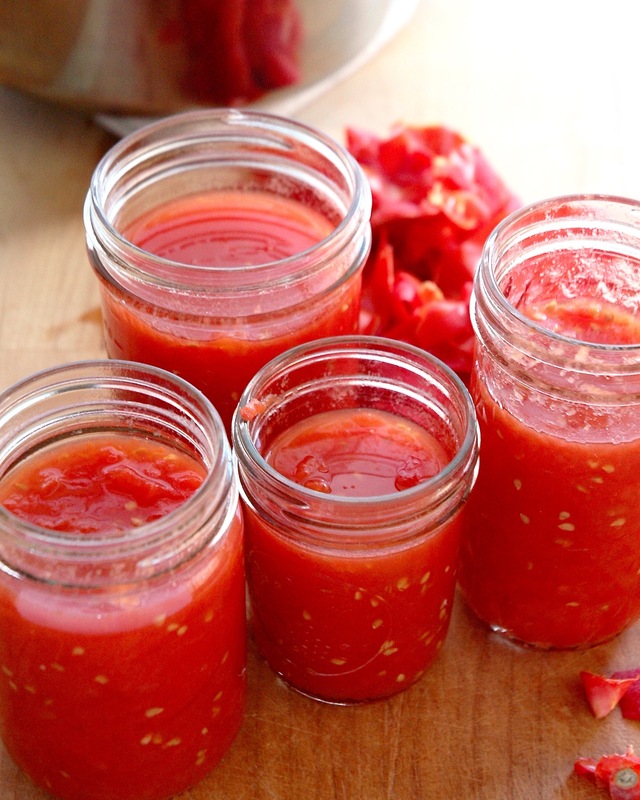 Homemade stewed tomatoes are literally as easy as 1..2..3. 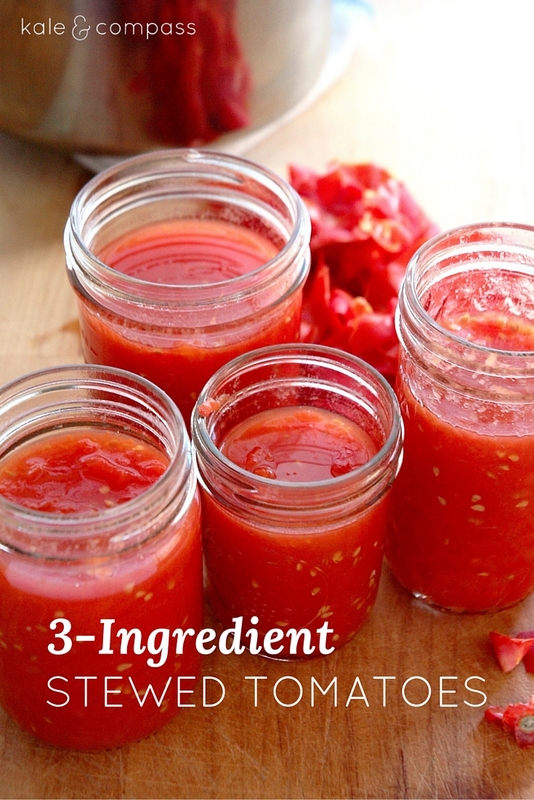 Three steps, three ingredients. That’s it. I can’t even believe it took me this long in life to make this discovery. For shame, I tell you, for shame. Something awesome I’ve noticed? It’s much easier to make tasty delicious meals when I’m using homemade ingredients and elements I’ve made from scratch. 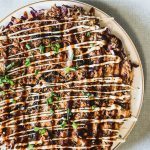 Sure, it takes a bit of time; a bit of trial and error to find the perfect method or recipe or process… but when I’m throwing things together on a busy weeknight, and I’m too tired to think too hard about dinner, the flavor is already there. I just have to put the pieces together. It almost feels like cheating. And if it’s wrong, I don’t wanna be right! Yee-haw. Two: Zero Waste Means No Canned Stuff. Shopping “zero waste” is more than just recycling the packaging you bring home from the store. It means trying to avoid it at all cost. Frankly, I love shopping this way because it means I don’t have to deal with heaps and piles of recycling/waste related to food packaging when I get home. 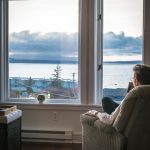 I’m lazy, and I’d rather just not have to deal with that. Instead, I bring reusable containers and cloth bags to the store. 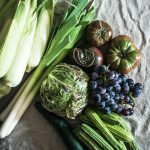 My store is great (thanks, Ballard Market!) and very accommodating with my unusual shopping style. Maybe one day it’ll be the norm… a girl can dream! Three: Cooking Simple Things is Relaxing. This might just be a “me” thing (I hope it’s not! ), but going through the motions of preparing a simple and basic recipe like this one relaxes me. It’s almost meditative and certainly soothing. I focus on one task instead of trying to do it all. Simple as that. These days, with technology in our faces 24/7 every-damn-day it’s really nice to savor the moments that aren’t so focused on all that stuff. I like it! Try it, you might like it too. My goal this summer = buy a ton (okay, maybe just a flat) of tomatoes from my farmer’s market at the very end of the season, when they’re good and cheap. Then I’m gonna stew ’em and can ’em and probably actually just keep them in my freezer because I don’t have much storage for real canned items in my tiny, tiny apartment. My goal next summer = grow my own tomatoes on my own tiny porch. At present, I’ve got a black thumb (I kill plants for a living) and I know precisely nothing about growing my own food. For now, I’ll leave you with this glorious stewed tomatoes recipe while I go research gardening hunt for Pokemon. 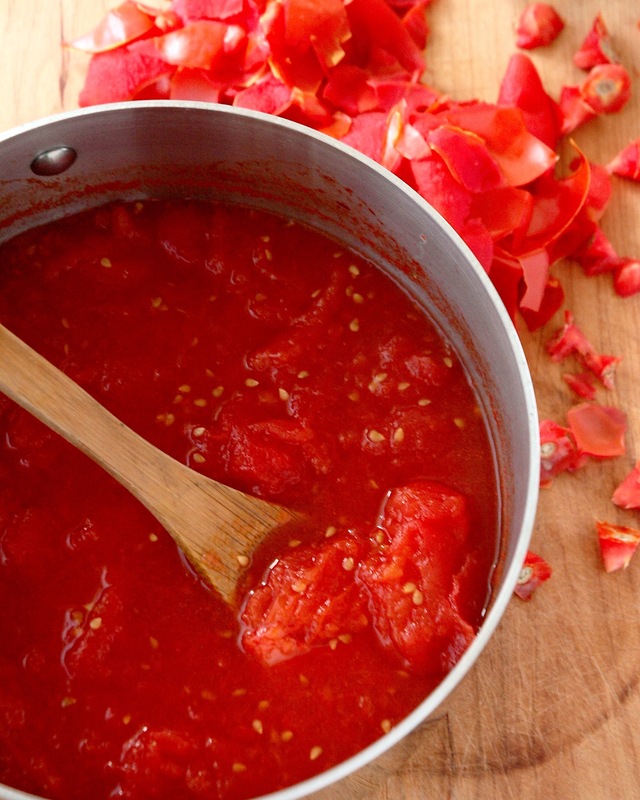 *My stewed tomatoes recipe is a pared-down version of this one, by Brooklyn Farm Girl. Round up your tomatoes. I usually go with 10-15 ripe Roma tomatoes. Core and score the tomatoes. This will make them much easier to peel after you’ve boiled them. I score the bottom end of each tomato, opposite from the core. 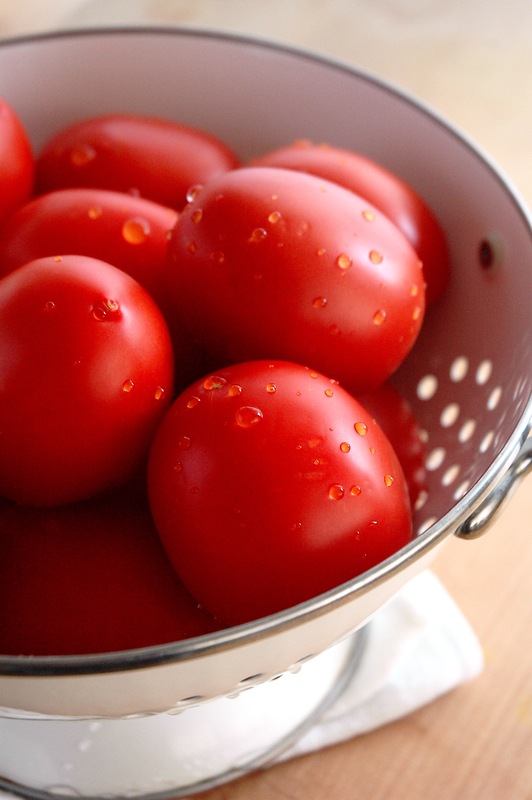 Once your water is boiling, gently place tomatoes into the water bath and boil for a minimum of 30 seconds, but no more than 2 minutes. You should see the peels start coming away from the flesh. 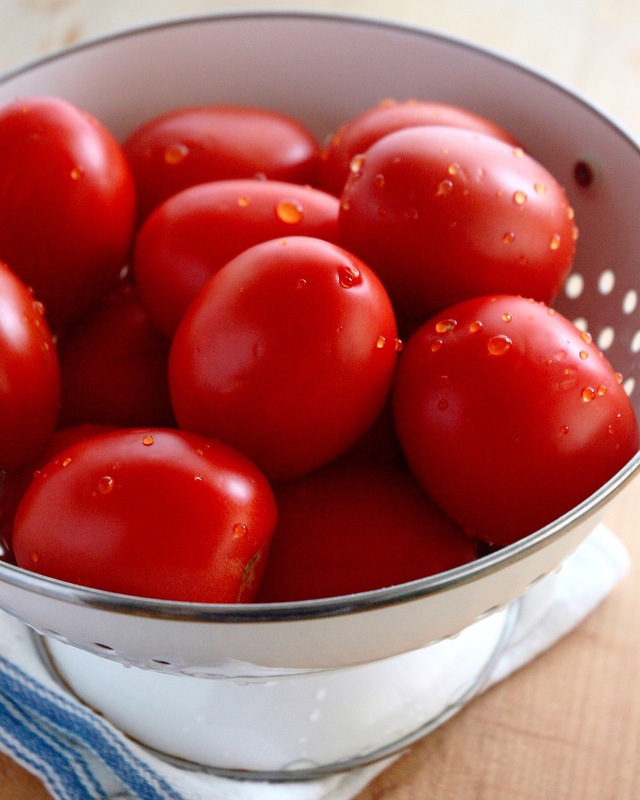 Once ready, remove your tomatoes and plunge into the ice water bath or colander to cool. Peel the skin from the tomatoes. 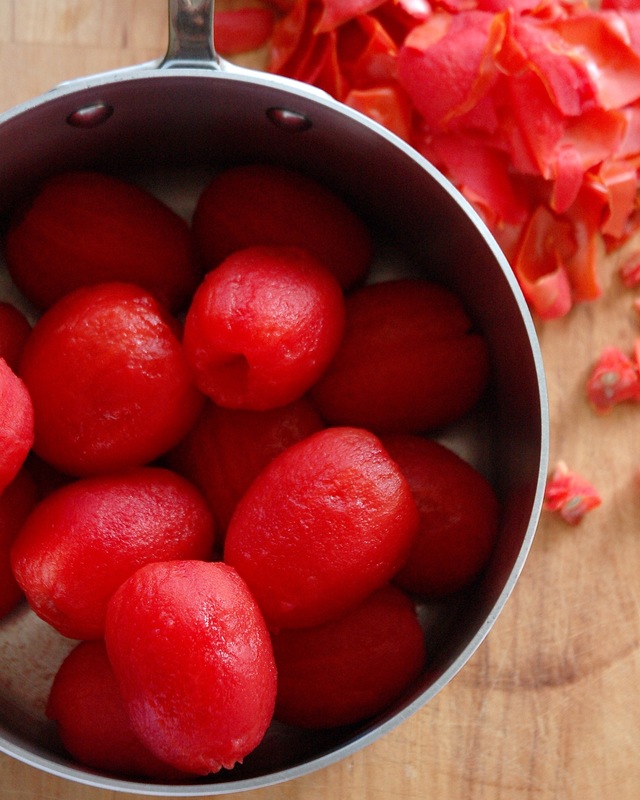 At this stage, if you’d like to freeze your tomatoes whole you can. 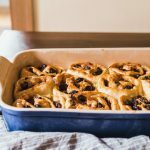 Freeze separately on a baking sheet and once frozen, put them altogether in an airtight container. 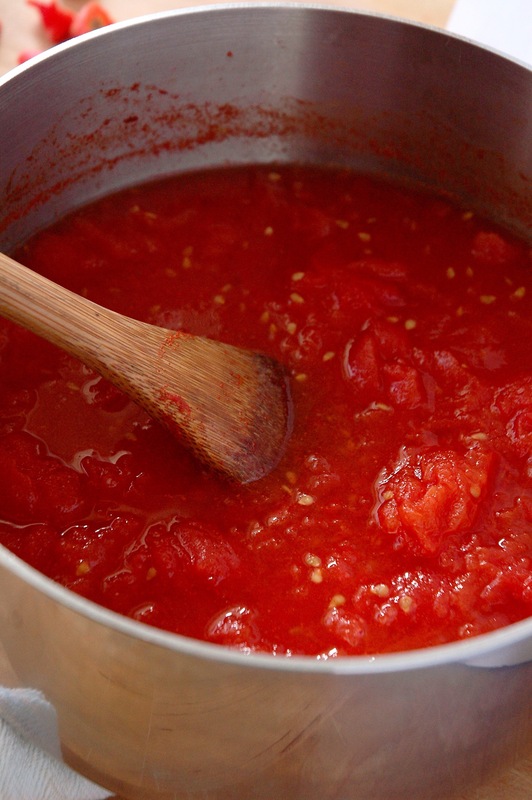 To stew the tomatoes, add them to a medium saucepan with sugar and salt. 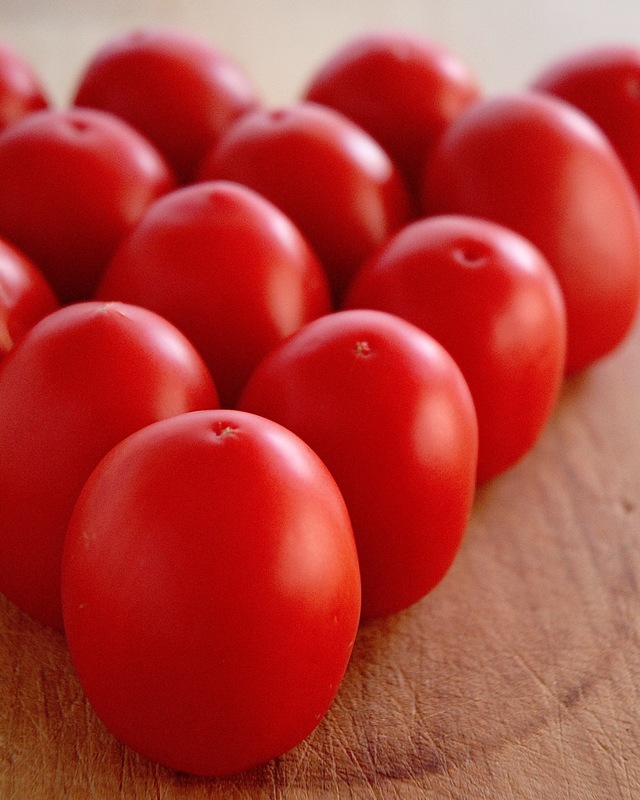 Cook tomatoes over medium heat, partially covered, breaking them up as they cook, if desired. If they’re boiling too much, turn heat down to medium low. After 30 minutes, your tomatoes will be done! Hooray! 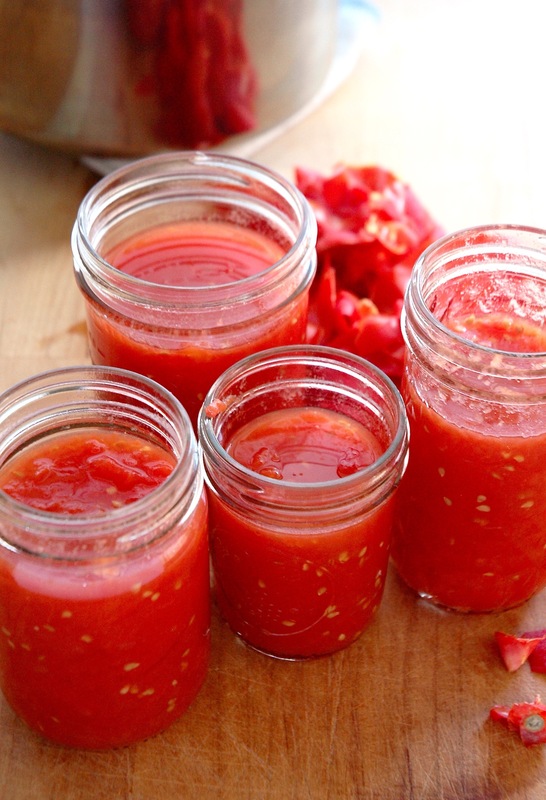 Portion stewed tomatoes into freezer-safe jars or airtight containers for the fridge. If frozen, they should keep for at least 6 months and up to a year (ours never last that long though). If refrigerated, use within one week. 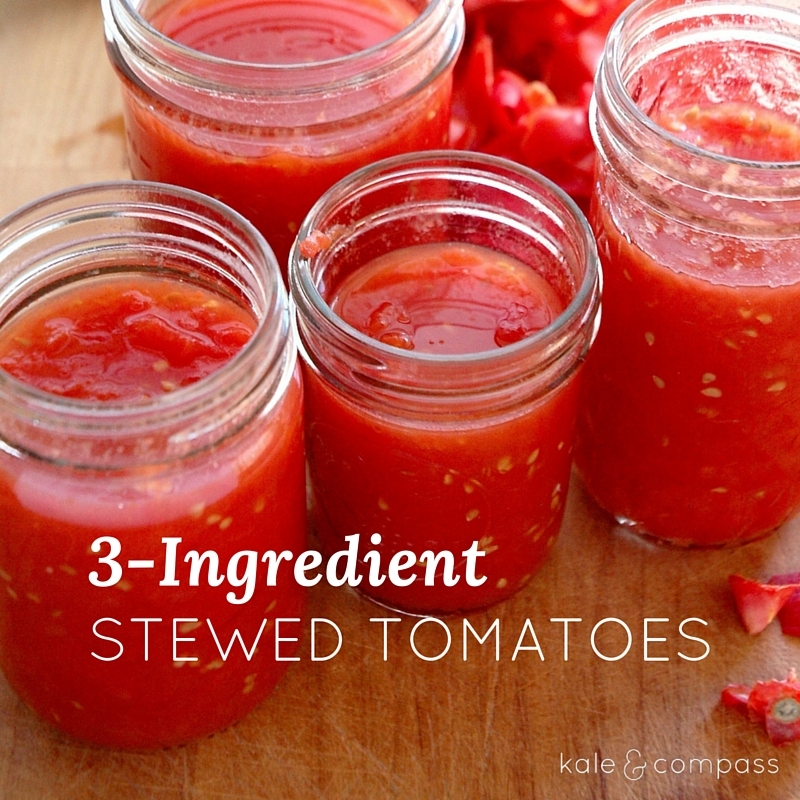 Homemade stewed tomatoes are as easy as 1, 2, 3! Three ingredients, three steps. 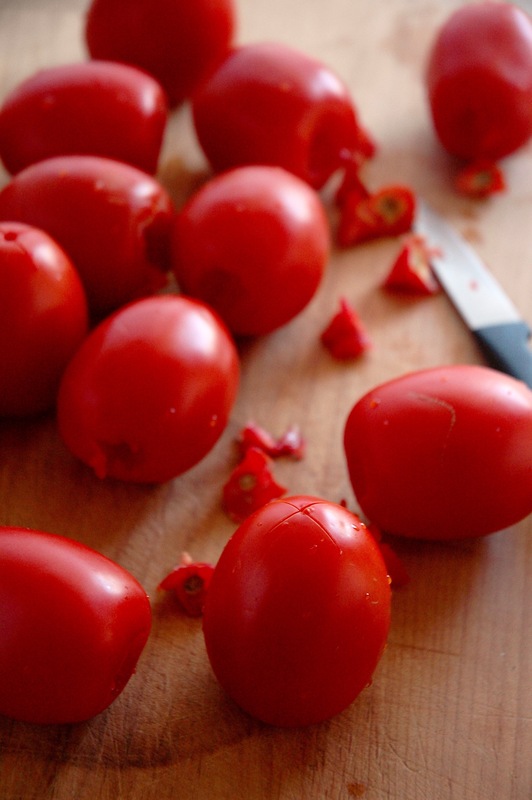 Take advantage of tomato season with this simple tasty recipe! Prep: Bring a large pot of water to a boil. If desired, set aside an ice water bath of equal parts ice and water in a large bowl. Core and score tomatoes. 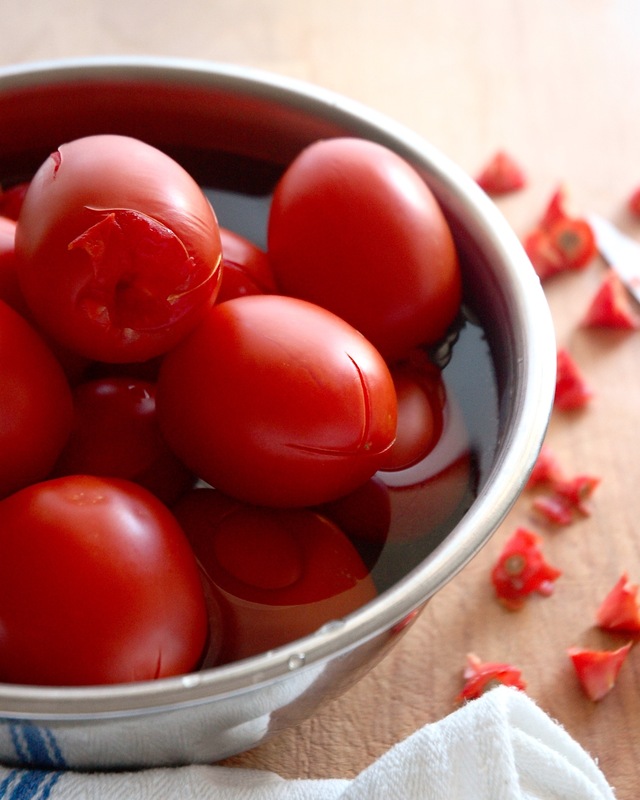 Boil: Once water is at a rolling boil, carefully add the tomatoes to the pot. Boil for 30 seconds to 2 minutes, or until you see the peels coming away from the flesh. 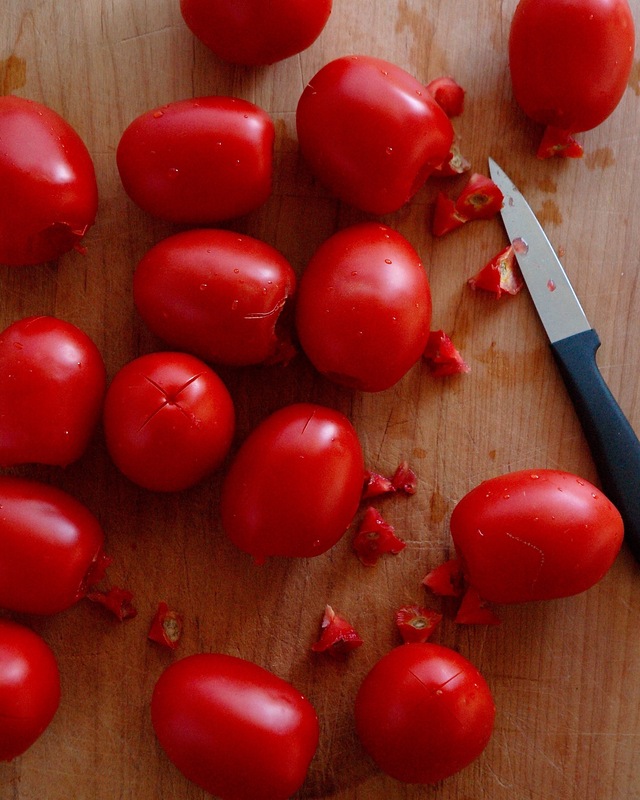 With a slotted spoon, remove tomatoes from the pot and plunge into ice water bath (or drain into a colander) and let cool. Once tomatoes are cool to the touch, peel away the skin and discard (compost). 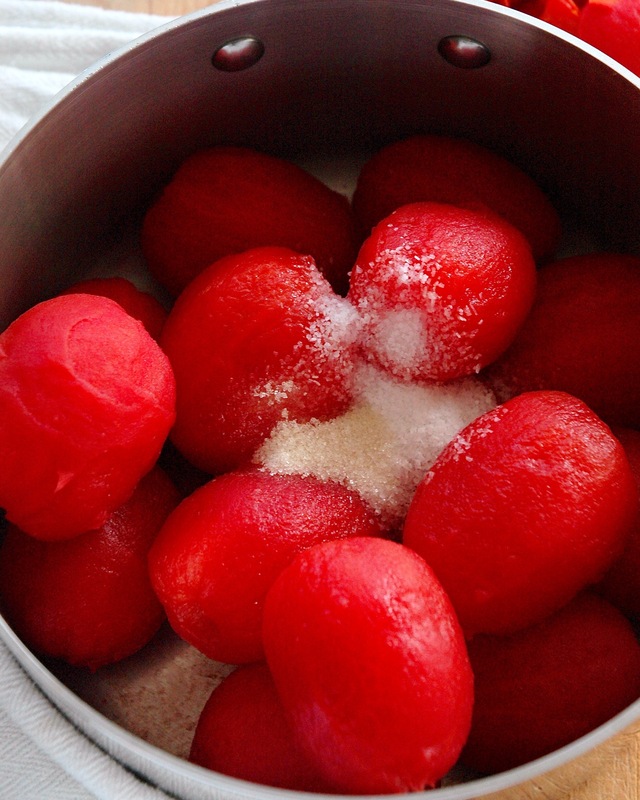 Stew: Place peeled tomatoes, sugar and salt into a medium saucepan. Turn the heat to medium and cook tomatoes, partially covered, for 30 minutes, breaking them up with a spoon if desired. Tomatoes will be done after 30 minutes. 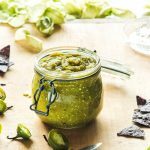 Either use immediately, or let cool and store in the fridge or freezer in airtight containers. *If storing in the fridge, use within 1 week. 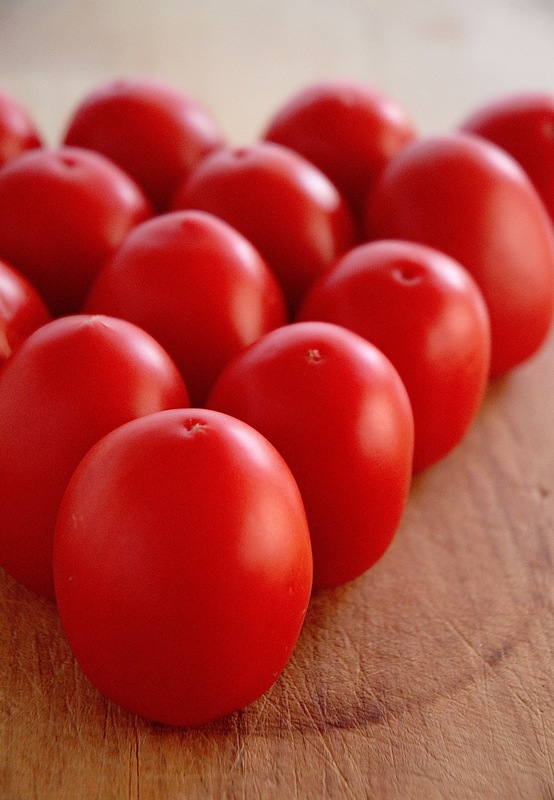 If freezing, tomatoes should keep for at least 6 months.